Receivers for the radiotracking and for the location of PTT tags must enable the received frequency to be optimized (with 1 kHz step or less in SSB mode). Fine-tuning changes the output acoustic tone and also the output power. This influences the signal "readability" (recognition in the background noise) and/or the signal character in subsequent analysis. Same PTT signals (generally 401.6500 MHz +-40 kHz) recorded with different tunings of the scanner Yupiteru MVT7100. The height of the signal (up, y=power in -dB)) is representing the "power" and thru this also the output signal-noise-ratio. The corresponding output audio frequencies (down, y=output frequency) are negatively correlated. Low frequencies (<1500 kHz) are less useful in further analyses (data modulation reading, radiation diagrams). For this PTT and receiver the optimum tuning is 401.6525-.6535 MHz (USB) with the output ton about 1500-2500 kHz. A comparison of IC-R10, Yupiteru7100 and AR8000. Note rectangular envelope of PTT signal for the IC-R10 (without AGC) while two other scanners with AGC are characterized by a typical constriction of the beginning. Graphs are showing that this automatic regulation is delayed about 20-30 ms. This delay is very important for the conventional radiotracking with short signals (length about 20ms with 1s breaks). These VHF signals are NOT INFLUENCED by AGC hence all scanners with SSB can be easy used with directional antennas to angle a tag! The reduction of the signal is important if working with extra strong signals e.g. from close vicinity to transmitter. The receiver will still work in optimum and its indicator will not be over-excired if signal is adequately attenuated. Manual gain control enables in IC-R10 a precise location of tags from only a few cm (e.g. if under ground) or a precise indication of fluctuating signal from a rotating antenna. This drawback of scanners with AGC can be partly substituted by external attenuators. I effectively use units 20, 40 or 60x with attenuating T-element made from SMD resistors. In the E12 row the resistor combination consists of 2x47r and 4r7, 2r5 or 1r5 respectively. These units can be combined with the scanner internal ATT function or linked together. However, this is not working from an ultra short distance to a transmitter as signal is also prolifering/infiltrating/leacking using/thru other paths than antenna input. 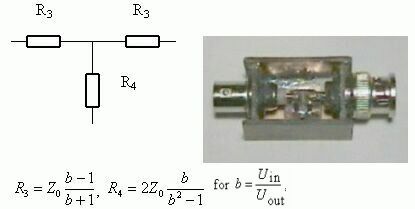 Figure shows the attenuator based on SMD resistors.